On the 14th of April, the second day of the Assamese calendar, our village was hit by a massive earthquake, the source of which was hundreds of kilometers away over the Burmese border. Who knew that we would be ringing in the new year with such a massive shake? Local sirens went off, and all the old ladies of the village started to give uroli from their front yards (a traditional warning call). As the aftershocks subsided, loud thunder cracked over the village, the sky went black, and heavy rain fell down upon us. The next day was clear, but little did we know of the real storm that was about to hit. We celebrated the first two days of the Bihu festival with as much pomp and joy as always, but every night the rain showered down hard. 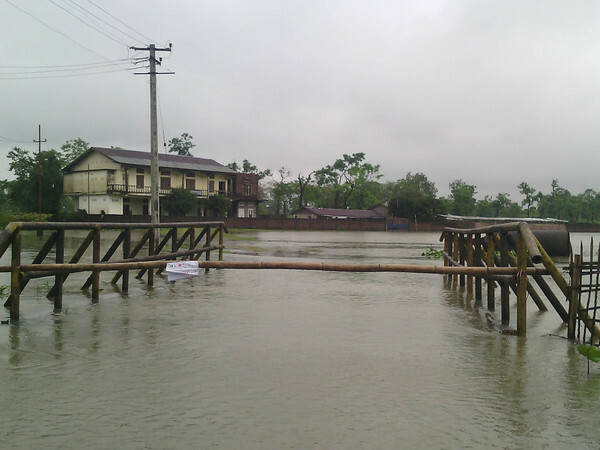 A week after Bihu, a hail storm wiped out the electricity supply for the village. As we waited in our houses, the electricity company told us the transmitters were badly damaged. It took three days for them to restore power, while the rain unrelentingly fell, and the villagers continued to wait. The rain continued to pour until all we could see was water. It was like looking out at the ocean, the land endlessly covered by water.